精心草聖。 A dedicated sage of the cursive style. Today Huai Su’s writing is used as a classical example for calligraphers around the world who wish to deepen their understanding of this style. Today as in the past, calligraphy is enjoyed as a form of meditation, relaxation, and mind-body practice.3 In countries that have developed their own calligraphy traditions such as Japan, Taiwan, and Korea, it not only represents an artistic practice but a philosophy embedded in thriving communities that have developed unique approaches to character design. Calligraphy is a part of the primary school experience for many students. In Japan, for example, middle school children fulfill a minimum two years of practice in class. In the last eight years of my own research, I heard adults describe these courses as “torturous.” Yet, they also speak of a nostalgia for the smell of ink and starched white paper and the sound of ink sticks rubbing against stones. Figure 1. The progression of the character for “horse.” 2015. The history of calligraphy is not a linear story and there have been many periods of redaction, re-stylization, simplification, and abstraction; from Emperor Qin Shi Huang’s (秦始皇 221 BCE) destruction of texts bearing older writing styles to Mao Tse-tung’s 1956 push for greater literacy in the countryside, which resulted in the National Standard Character Set (国家标准) of 1980. The history of Chinese characters is really the history of East Asian calligraphy, and there was little difference between the two until movable wooden type was developed in 11th century China. When the first typefaces were designed, people naturally looked to the way the characters were written with a brush as the source for a legible “block” style. The traditional shapes made with a brush are vitally important because they’re closely tied to legibility; even minor changes to the strokes can render some characters confusing or illegible. The long evolution of the characters from bones to calligraphy to movable type produced a standard or regular block character style called kaishu (楷書). This is the script style that is nearly ubiquitous anywhere you see Chinese characters being used. Figure 2. The progression of characters’ legibility as pixels increased. Courtesy of QZ.com. The complication of the written language and the vast number of characters that require designing makes the creation of a new complete Chinese character font an overwhelming challenge. Each complete typeface contains at least 6,766 characters that would have to be designed. As design journalist Nikhil Sonnad writes, “Raw numbers of fonts are hard to come by, but suffice it to say that there are far fewer for Chinese than there are for Latin languages.” 5 Today there is more demand than supply for new and interesting fonts that can express characters in a variety of styles both traditional and contemporary. A quick Internet search produces many half-complete font sets for download which usually contain only a fraction of the characters needed for literacy. There are just a few “raw” fonts that come built into most devices. Figure 3. A side-by-side comparison between the Heiti (sans-serif) and Mingti (serif) characters. There is a list of basic CJK fonts (Chinese/Japanese/Korean), which are categorized as Simplified Chinese, Traditional Chinese, Japanese, and Korean font sets. All fonts using Chinese characters are divided into sets that have no serifs added (called Heiti) or have serifs added (Mingti). (Fig. 3) As it stands now, one of the only major CJK fonts that has any calligraphic sensibility is a Japanese font called “Hanazono Mincho,” because it bares traces of a “stroke order” originally inked with a brush. This font has been adapted for use in Taiwan as well. One can imagine given these limitations that users of Chinese characters can grow bored with the same fonts that dominate print and digital landscapes. Companies like Taiwan-based JustFont are quickly mobilizing. In 2015, JustFont utilized crowdfunding sites to raise fast money for a new traditional character font called “Jin Xuan.” Within 80 minutes of launching their crowdfunding campaign, they raised NT$1.5 million (USD$48,300). Blogger Kassy Cho writes of JustFont’s new Jin Xuan font: “Named after a variety of oolong tea originating in Taiwan, Jin Xuan is a font that, according to JustFont, is both rational and emotional, combining the warmth of the Ming (明體) typeface (serif) and the modernity of the Hei (黑體) typeface (sans-serif).”6 Projects like these have to be taken on by teams of designers who undergo a complicated research process into calligraphy, existing Chinese character fonts, and Latin-based fonts to develop an overarching style or philosophy that must unify thousands of characters. Then each individual character has to be sketched out on grid paper and refined for balance, legibility, and creative flair. Most fonts, whether simplified or traditional, reflect in some way a connection to the history of East Asian calligraphy. That is why it is essential that designers continue looking at classical and contemporary calligraphers who have experimented with the same issues of balance, individual character design, and artistic flair versus legibility. There is real opportunity for design teams who take on a Chinese character font project. Traditional calligraphers also have the ability, with their technical and critical know-how, to inspire a push towards new paradigms in typeface design. Figure 4. The progression of the character for “see.” Courtesy of Kanji Text Research Group. In East Asia, there is already a large market for calligraphic typeface. Local restaurants and regional products such as Japanese sake use logos that are often created by a master calligrapher. There are instances where the “cracked bowl” beauty of the hand-written is an appealing trope used to evoke feelings of nostalgia, home, and family. Think of an English font you might use for Main Street, America. The popular Japanese fast food chain Ootoya, found all over Japan, serves local comfort foods and brands itself with a logo which borders on kawaii (or “cute”) with its bubbly strokes, while preserving a certain traditional integrity. Comparatively, the logo for Ikkoryu Fukuoka Ramen is designed with angles that evoke modernity and movement. The famous sake company, Koshino Kanbai, uses a typical font script that you see on many Japanese sake bottles. Figure 5. 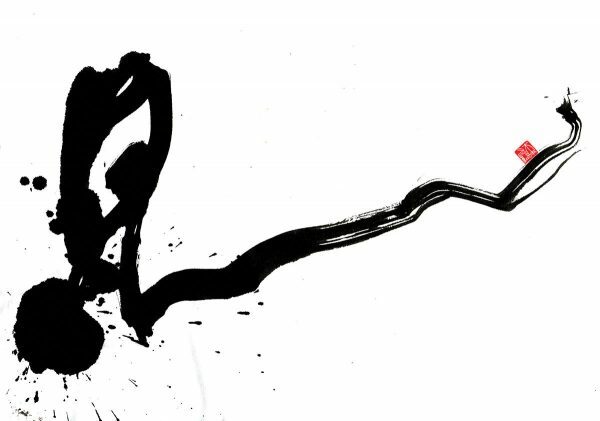 The character “to see,” written by calligrapher Asami Maeda. Courtesy Asami Maeda. The ubiquitous “regular block” style is here to stay, but there is a need for creative alternatives that appeal to different lifestyles, identities, and feelings. (Fig. 5) Devices now have screen resolution to display highly stylized Chinese characters in detail, so it is not impossible to think that these alternatives would be used in digital spaces with ever-increasing frequency. This essay presents a case that will hopefully prompt designers to investigate the potentials of involving more contemporary calligraphy in typeface design. This line of research has become the lead-in to a much greater question of the ways in which calligraphy influences how all digital language is expressed. The focus is not on returning to tradition but rather intersecting typography with modern calligraphic ingenuity.